After winning first place in the 10th Annual Best Places to Work in Northern Nevada for the large business category, Greater Nevada Credit Union held a groundbreaking ceremony Wednesday in celebration of its new 4,500 square foot branch at Eagle Station Lane. 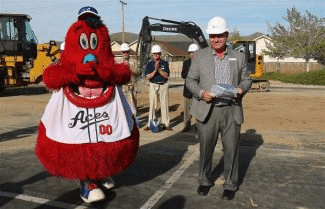 With a performance by Carson High School’s Jazz Band on construction grounds and a surprise appearance by Reno Aces mascot, Archie, President and CEO Wally Murray commenced the ceremony by discussing the credit union’s roots in Carson City. Assemblyman Al Kramer and Mayor Bob Crowell also attended to support the credit union’s latest expansion. The event also was supported by the Carson City Chamber of Commerce, and Shaheen & Beauchamp Builders. The Board of Directors of the credit union joined Crowell with ceremonial shovels to officially break ground on the site. Director Alex Talmant said the expansion of the credit union in Northern Nevada also will extend the presence of the company’s service. The credit union team received its most recent award in April from the Northern Nevada Human Resources Association, in collaboration with Greater Nevada Mortgage. According to Director Bill Arensdorf, it’s also the largest credit union in the region, with 12 locations reaching beyond Carson City, including Dayton, Gardnerville, Reno, and Spanish Springs. Last year, the credit union also reached its 10th consecutive year voted as Best Financial Institution, in the Appeal’s annual Best of Carson City poll.